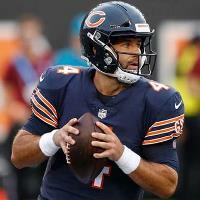 With Mitch Trubisky recovering from a shoulder injury he suffered last week against the Minnesota Vikings, backup quarterback Chase Daniel is scheduled to start this week on Thanksgiving against the Detroit Lions. Even though Daniel has had a short week to prepare the Bears are confident they won’t miss a beat even though he hasn’t started a game in the NFL since 2014. The Bears confidence stems from the fact that Daniel has five years of experience accrued in Matt Nagy’s offensive system (three of those while they were with the Kansas City Chiefs, where Nagy was quarterbacks’ coach) and also a year with the Philadelphia Eagles. The fact that Daniel knows this offense liked the back of his hand should make for an easy transition for both the Bears’ players and the coaches themselves as he’s a quarterback that brings knowledge, leadership, and experience to the huddle. Although Trubisky’s loss is a sensitive one perhaps the Bears are unlikely to feel his absence due to the fact that in Daniel they’re getting a backup that knows where to go with the ball in open space and knows well how to read a defense. Although Daniel has a 1-1 record as a starter the Bears are not fretting as his familiarity with their offensive scheme will allow them to keep it intact. Rather than needing a big game from Daniel, the Bears need him to be careful with the ball and avoid costly mistakes as that is one of the best things that Trubisky has provided this season. Trubisky, not only provided ball security as he avoided costly mistakes, but he knew how to make big plays with his legs when things fell apart in the pocket to get first downs and keep the chains moving. In the past, Daniel has proved he can definitely make very good throws, but he’s also shown that he can turn the ball over and that has to change in this game for the Bears to win.